Few things in life are truly finite. Few times are we presented with a situation where we know there will be no chance to try again in some capacity. For Bo Ryan, that truly finite moment happened on Monday night as the clock ticked down to 0:00 and Duke players stormed the court to celebrate. In the aftermath of Wisconsin’s loss to Duke, Bo Ryan didn’t say the things we’ve become conditioned to hear from a losing coach. He criticized the officiating. He took a not-so-thinly-veiled shot at one-and-done players like Jahlil Okafor and Justise Winslow. He wasn’t beaming with positivity about the amazing season his team had just completed. He was bitter, angry, and unhappy. And he’s taken a lot of criticism for it during the past 24 hours. I’m not saying Ryan should be lauded for speaking his mind. I’m not saying he should be vilified for failing to ‘lose the right way’. I’m not saying he showed his true colors when that microphone was put in front of his face just minutes after one of the most difficult defeats of his life. All I know is that his reaction was the product of someone who knows Monday night was his best chance to achieve something that he’s sought his whole life. Only to have it slip through his hands. Frank Kaminsky went from a player who scored 1.8 points per game during his freshman season to National Player of the Year as a senior. Unlike most juniors who have the NBA calling, Kaminsky turned down going pro to return to Wisconsin for one more run. Sam Dekker peaked at the right time, rode an incredible shooting streak through the later rounds of the tournament, and showcased how much potential he has at the next level. Both are sure-fire first-round picks in this June’s NBA Draft, and they might even end up being lottery picks by the time all is said and done. Both are surely leaving Madison, and with their departure go the Badgers chances of trying to replicate the successes of the past two years. Bo Ryan is not John Calipari. He isn’t going to reload his roster with future first-round picks to replace Kaminsky and Dekker to make another run next season. 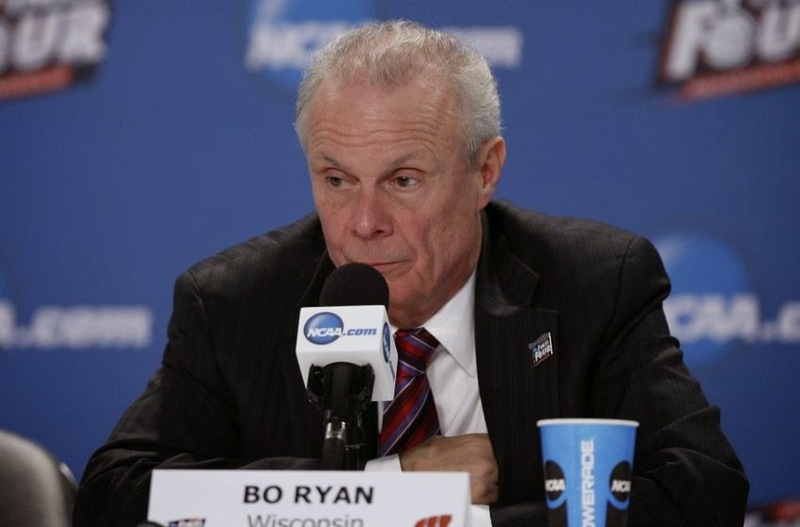 Bo Ryan is 67 years old. He’ll turn 68 before the Badgers are entrenched in Big Ten play next season. He’s surely got more good years left in the tank and he’ll surely guide the Badgers to the NCAA Tournament many times before he retires, but getting back to the title game will be a vicious race against time. He knows this team, one that had the most efficient offense in college basketball history, was the perfect storm. It was unequivocally his last, best chance to capture a championship. So what did he do in the face of coming so close only to fall short? He ripped the officials. He ripped one-and-done players and a system that he feels has been manipulated by other coaches to their own benefit and his disadvantage. He said things some of us found unbecoming of a man in his position. After all, this was a fantastic year for Wisconsin and it just doesn’t feel right to end things on a note like this. Frank Kaminsky won Naismith Player of the Year. The Badgers beat the seemingly unbeatable Kentucky Wildcats and denied them from making history. They won 36 of 40 games. They won the Big Ten Championship. At least two of Ryan’s players will be first round picks this season and make millions of dollars playing basketball for years to come. But the team still came up short of the ultimate prize. Bo Ryan just watched his dreams go up in smoke on a basketball court in Indianapolis on Monday night. Something he worked for his whole life. Something he sacrificed for. Something he burns for. Something that has driven him to do things most people would consider insane. Something that was so close he could taste it. I’m in no position to criticize whether or not his post game comments were out of line because I have no idea what it feels like to work your whole life for something only to come up agonizingly short and know you’re out of chances. His comments on Monday night were how Bo Ryan dealt with the death of a dream. I have no context with which to judge him. I hope I never do.